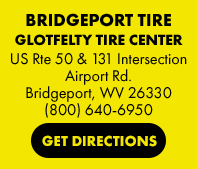 Since 1956, Glotfelty Enterprises has serviced the automotive repair, tire, and wheel needs of customers throughout Maryland and West Virginia. Today, we have seven locations in Oakland, MD, Elkins, WV, Lavale, MD, Petersburg, WV, Morgantown, WV, Parkersburg, WV, and Bridgeport, WV. Come into any Glotfelty Enterprises center for a quote on an automotive repair service or set of tires. We have tires for every budget from trusted brands. You can also schedule your appointment online. If there's something wrong with your car, use our fast, free vehicle diagnostic center to figure out what's wrong.